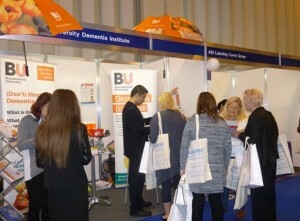 Dr Fiona Kelly, Dr Suyu Liu and Dr Michelle Heward represented Bournemouth University Dementia Institute (BUDI) at the Care and Dementia Show held at the NEC in Birmingham from 2-4th November 2015. The Care and Dementia Show is designed to provide education, products and services to any organisation responsible for the care of older people. This show attracted over 300 national exhibitors from many sectors of the care industry, including care home providers. This was a fantastic opportunity for BUDI to network and meet a range of potential collaborators. During the event we met over 200 delegates, many were interested in BUDI’s research and education services, including the MSc Applied Dementia Studies programme. The show was a good opportunity to meet practitioners in the field of dementia care, and to see first-hand the range of products and services on offer to people affected by dementia.